The particular climate and soil conditions that characterise coastal land areas are reflected in their typical vegetation. These areas may include both ecosystems that are exclusively coastal in nature (sand dunes, salt marshes, estuaries, lagoons, etc.) and others that aι-e not limited to coastal zones (brushwood, pine forests, deciduous and broad-Ιeaνed forests, etc). In the coastal zone of Strymonikos and Ierissos Gulfs a total of 808 plant species and subspecies have been recorded, some of which are threatened and are protected by Greek and European legislation and by international conventions. Coastal vegetation: Sand-binding plants: these species, adapted to life on the sand, help in the creation and preservation of the sand dunes. Halophytes: species adapted to life in salty soils. Plants of the rocky shores: these species have strong root systems to support them in fissures or hollows in the rocks. Aquatic and Riparian vegetation: Grow in and beside rivers and streams. These include submerged and floating plants, reeds, poplar groves and stands of plane trees, with many water and shade plants in their understorey. Evergreens - Mediterranean Sclerophytes: This type of vegetation, which extends inward from the shore, has evergreen and sclerophyllous shrubs (kennes oak, lentisk, cedars, arbutus trees, etc.) and scrub species, such as rockroses and spurges. Deciduous - Broad-leaved plants: Found mainly on Mount Stratoniko, this type of vegetation includes forests of oak, chestnut and beech, with their attendant shrubby species. Plants play an important role in the marine environment, for they constitute the basis of all the food webs, contribute to the oxygenation of the coastal waters and provide shelter and breeding places for many animal organisms. Algae: A very large group of lower organisms. Depending of their size is divided into micro and macroalgae. Microalgae (phytoplankton): Microscopic unicellular algae that live suspended in the water and are carried passively by the waves and currents. Several species form colonies, and many are flagellates. They live in the upper layers of the water, where there is enough sunlight for photosynthesis. Macroalgae: Multicellular organisms, most of which live attached to the sea floor. A1though they do not have the familiar plant structure (roots, leaves, etc. ), they do present a considerable diversity. They vary in size from species resembling microscopic ribbons to species exceeding 2 m in length. These organisms are divided into three classes: green algae (Chlorophyceae), brown algae (Phaeophyceae) and red algae (Rhodophyceae). They form characteristic colonies in each sub-zone (supralittoral, midlittoral and infralittoral), like those of the brown algae Cysosteira, whose small brown bushes provide a habitat for large numbers of organisms. The Mediterranean Sea has about 1000 species of macro-algae. Angiosperms (higher plants): Flowering plants that live submerged. They are the descended from terrestrial ancestors, that returned to the marine environment 200 million years ago. Like terrestrial plants, they have roots, leaves, flowers and seeds. 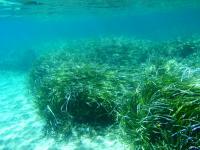 Most species form extensive beds on the sandy bottom. The most important species in the Strymonikos and Ierissos gulfs, as indeed throughout the Mediterranean, is the marine grass Posidonia oceanica.